One principle of composition in art is “rabatment”. 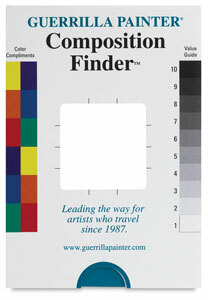 A rabatment is used in paintings with rectangular formats. This technique helps you place your most important compositional elements. By consciously applying this approach, your compositions will be stronger. You may be puzzled about the term. I was, and I have yet to find a formal definition for it—either in a dictionary or online. Leaving aside the question of the word's origins, however, let's find out how rabatment can help you quickly place the major elements of your composition. How do you create a rabatment? On a rectangular canvas, if you create a perfect square starting with one of the two short sides, this square is rabatment. In a horizontally oriented rectangle, you have either left or right rabatment. In a vertical rectangle, you have either top or bottom rabatment. When you place the most important compositional elements within either of these squares, you are likely to produce a stronger composition. By that I mean that the drawing or painting will have more unity and balance. The elements in the rest of the rectangle should be subordinate to the rabatment subject. I think that the reason for this is that in a rectangular painting, rabatment tips the balance of dominance. This way, you will only have a single focal region and you will not have both ends of the painting crying out to you for equal attention. 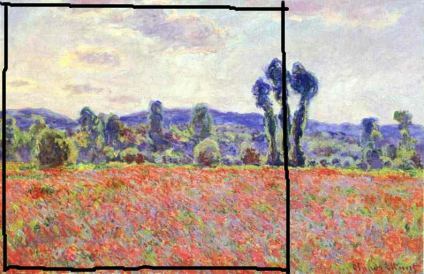 Take a look at Claude Monet's field of poppies (if you explore my site, you'll quickly realize that I like his work). The concept of rabatment is obvious here. In the western world, one typically reads from left to right, so Monet carefully composed the tallest tree where the rabatment square ends. Because of this, your attention tends to stay inside the rabatment, where the main focal point is found. It is a very pleasing effect. So when you compose a drawing, you can adopt the same principle by enclosing your focal point in a square inside the canvas. You can user either upper or lower rabatment on a vertically oriented rectangle, or left or right rabatment on a horizontally oriented canvas.